When I received the new Poison Tail jig mold, I had no idea that I was in for such a Bass bonanza. What perfect timing! Weedless jigs for Bass are certainly nothing new. Do-It molds have offered quite a variety of weedless Bass jigs for many years. They vary from a simple round head that not only works well for Bass, but anything from Walleye to Muskies that relate to weedy or timber structure. Other head styles are more technique specific like football heads which lend themselves to dragging along the bottom. Or flippin style heads which are designed for penetrating heavy cover and going toe to toe with big Bass on a short line. Others like the bullet head jig are excellent for swimming type retrieves. Do-Its new Poison Tail jig may well be the best of all worlds wrapped up in one package. The sizes are broken down into two molds. The PTJ-3-S makes one-eighths, one-quarter, and three-eighths ounce versions with 1/0, 2/0, and 3/0 hooks respectively. These sizes are perfect for spring and early summer largemouth and smallmouths. The one-eighth ounce is also perfect for light tackle farm pond type situations. As the season progresses and the Bass move deeper, the model PTJ-3-M makes one-half, three-quarters, and one ounce models. These can be deadly in deeper water or where the weight is needed to flip into heavy cover. All the sizes (except the one-eighth) gets molded with a FG-30 or YG-1 weed guard. This is probably the most popular weed guard for Bass and Pike applications. The one-eighth ounce head accepts the scaled down FG-12 weed guard which leads itself perfectly to more finesse situations. All the jigs feature the combination disk and holder collar. This collar easily accepts rubber skirts, plastic tails, tied hair or bucktail, or those spider skirts that have become so popular. The other great part of this collar style is that it accounts for a significant portion of the jig’s weight. Why is this important? Well it’s the old hidden weight system. You get a jig that has enough weight to fish effectively, but a size that will not intimidate finicky fish. Much of the weight is hidden in the skirt. 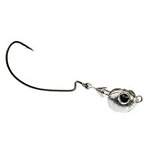 On the one-eighth ounce model, the actual head is only the size of a one-sixteenth ounce jig. The rest of the weight is hidden under the skirt. Due to zebra mussels and tighter environmental regulations, I am faced with clearer and clearer water each year. Smaller profile baits are definitely the answer. Let’s look at the head design. Recessed eye sockets for stick-on eyes and incredible 3D facial features. The details are outstanding. But let’s look past the pretty face and look at functionality. This head design is one of the most stable I have every seen. It sits upright on hard or soft bottoms, in weeds, or flipped into heavy cover. You want to swim a jig through some cabbage or coontail? This design swims as good as any bullet head. If you had to pick one design for all occasions, I think this is the one. Now comes the real closer, the Poison Tail hook. These molds accept the Mustad #91768 BLN extra wide gap jig hook. I have been fishing jig and pig combos for nearly thirty years and I know I never had a strike to hook-up ratio as good as with this head and hook combination. This hook has ample room for pork or plastic trailers and still room to bite the jaw of a big Bass. They are strong enough to land any fish out there, but thin enough to use light line. Many flippin’ type jig hooks are so stout that you need fifteen or seventeen pound test to assure a good hook set. That’s not true with the poison tail. If you want to go to eight pound test, you will be fine. I even used the one-eighth ounce model on six pound test for spooky Lake Michigan smallies and I hooked fish. Weed guards can either be molded in place or added later by using the one-eighth inch base hole pins. The one-eighth ounce Poison Tail requires a FG-12 or FG-9 added at the time you pour. Paint them and add either a flat or 3D stick-on eye and you are ready for tail options. Skirts made from living rubber, round rubber, silicone, or Luma flex spandex fiber are all great choices. I prefer standard round rubber due to it’s availability and value, although the silicone skirts make up a very attractive bait. You can either tie on the material using a matching size “D” thread or use rubber collars. Skirts built with rubber collars are easier to change or replace, but tied collars flair round rubber a little better. Another option is plastic. 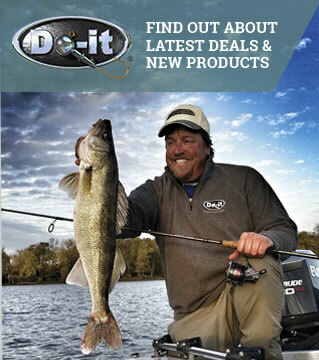 Do-it now offers their line of Slip-it skirts or use a simple Mr. Twister double tail or split double tail in pumpkin pepper makes a great crawfish imitation. Or you can try a combo type grub like Yum’s 4” Gonzo Grub. These spider typed grubs have a skirt and double tail all built into one bait. I’m a traditional jig and pig guy. My best combination last season was a brown and black round rubber jig matched with Uncle Josh’s new Maxx Pork. The Maxx Pork features the crawfish profile with claws that float! Both Largemouth and Smallmouth found this combination irresistible. The Poison’s Tail works equally well as a swimmer too. Heads and skirts in whites, yellows, or fire tiger tipped with a 4” Twister tail are great swim jig colors. Cast them out and reel them in. Think of it as a spinner bait without the blades. Swimming rubber jigs has become a hot tactic in the last few years. Jig it, crawl it. flip it, swim it, the choice is yours. But I can guarantee that the new Do-It Poison tail jig may be the most stable, best hooking Bass jigs that you have ever used. And there is nothing better than catching a fish on a lure you made yourself.